Roger Goodell and the NFL owners are squealing, the pain in the wallet is so intense. That is what it took to get them to use their out-of-touch heads and stop the kneeling stupidity. I think they believe it will be just like the good old days, the stadiums will be overflowing, the networks licking their boots, and the advertisers shoving piles of cash into their pockets. Nice try, but as for this football fan, I will stick to college ball. You have lost me forever. If the NFL has its way, the 11 players who still sat or took a knee for the national anthem at Sunday’s games will be the last, reports The Washington Times. 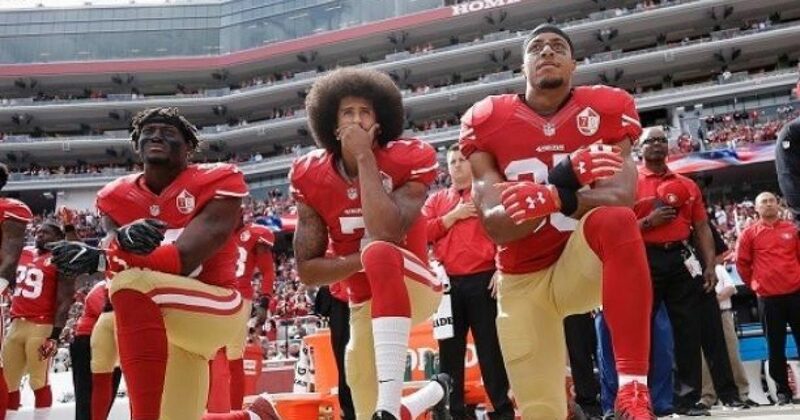 Leading the agenda at the NFL’s fall meeting starting Tuesday will be a discussion on how the league can stop the take-a-knee protests stoking fan outrage without incurring a backlash from players who have refused to stand during the anthem. Some football fans, including President Trump, have accused the players of disrespecting the military. The protests are blitzing the NFL’s bottom line. Ratings have tumbled by 7 percent through the first five weeks of the 2017 season versus last season, according to Nielsen data. Also in decline are the number of protesters. After nearly 200 sat or knelt three weeks ago in response to criticism from President Trump, fewer than a dozen did so on Sunday, an indication that even the players may be ready to move on. San Francisco 49ers safety Eric Reid, who has led the protests after the departure of his former teammate, free agent Colin Kaepernick, signaled Sunday that he was ready to make a deal. Reid and six other 49ers knelt before Sunday’s game against the Washington Redskins. Oakland Raiders running back Marshawn Lynch sat on the bench as he has done all season, Kansas City Chiefs cornerback Marcus Peters knelt and linebacker Ukeme Eligwe sat. NFL commissioner Roger Goodell has said the league will consider a rule change to require players to stand during the national anthem, prompting questions about whether they would actually be forced to do so. Given the free-speech issues involved, that’s unlikely. More likely is that the league will follow the lead of the Miami Dolphins, which implemented a policy last week allowing players who don’t want to stand to remain in the locker room or tunnel for the national anthem. Three Jacksonville Jaguars players have stayed off the field for the last two weeks rather than take part in the ceremony. Goodell said that he has reached out to players to hear about their concerns, adding that teams have taken the initiative by arranging police ride-alongs and meetings with local law enforcement. The owners have also taken the unusual step of inviting NFL Players Association representatives to attend the fall meeting. Meanwhile, the out-of-work Kaepernick re-entered the fray Sunday amid reports that he will file a grievance against the NFL accusing owners of colluding against him by refusing to offer him a job. After opting out his 49ers contract in March, Kaepernick has yet to be signed by any of other 31 NFL teams, although he told CBS’s Jason La Canfora a week ago that he continues to work out and wants to play for a team. Interestingly, some sports writers responded Sunday to the season-ending injury to Aaron Rodgers by calling for the Green Bay Pakcers to bring in Kaepernick. An analyst for Credit Suisse downgraded the price and earnings per share forecasts for Twenty-First Century Fox’s earnings due in part to the NFL’s poor Sunday ratings on Fox, CNBC reported. NFL spokesman Joe Lockhart said at last week’s press conference that the commissioner, owners, players and fans are all “frustrated” by the situation and looking forward to putting the protests behind them.